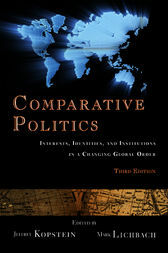 Now in its third edition, this unique textbook remains a favourite for introductory undergraduate courses in comparative politics. It features twelve theoretically and historically grounded country studies that show how the three major concepts of comparative analysis - interests, identities, and institutions - shape the politics of nations and regions. Written in a style free of heavy-handed jargon and organized to address the concerns of contemporary comparativists, this textbook provides students with the conceptual tools and historical background they need to understand the politics of our complex world. This third edition introduces completely new chapters on the European Union, France, and Nigeria.